The classic book on acting. Respect for Acting helped generations of actors hone their craft, and its advice is as useful now as it was in 1973, when it was first published. Legendary actress and teacher Uta Hagen knew that an actor's finest work was often achieved for love rather than for money. She lived this philosophy, alongside her husband Herbert Berghof, at HB Studio, their acting school; together they turned a handful of scruffy old buildings into a workplace and spiritual home for actors. 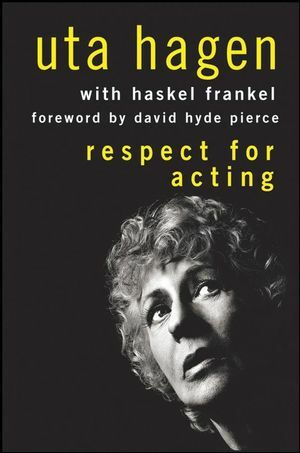 Respect for Acting is Hagen's blueprint for the actor, her design for enlightened stage acting. Among Hagen's distinguished students were Robert DeNiro, Jack Lemmon, Anne Bancroft, Fritz Weaver, Bette Midler, Geraldine Page and Steve McQueen. This book will continue to bring Hagen's techniques to actors and theater-lovers alike. Uta Hagen (1919-2004) was a German-born American actress and drama teacher. She created the classic role of Martha, in Edward Albee's Who's Afraid of Virginia Woolf?, on Broadway in 1962, and won a Tony award for it. Two years later, she reprized the role in London, and won the critics' award. But she was a teacher too. In 1947, she co-founded the Herbert Berghof Studios in New York's Greenwich Village. With the HB Studios, she began developing and teaching acting techniques that continue to inspire generations of artists, and her Respect For Acting remains a standard text in many acting schools. Much of it is based on her belief that natural talent was only the starting point in the development of craft. Haskel Frankel (1926-1999) was a prolific author and drama critic for publications including The New York Times, The Saturday Evening Post, The Saturday Review, Show magazine and Playbill. He also helped write several works credited to prominent performers, including Respect for Acting by Uta Hagen.